Key difference: Blenders are better suited to working with liquids, whereas food processors essentially work well with more solid foods. Food processors have more functions than a blender. Both food processors and blenders are kitchen appliances that aim at making repetitive necessary tasks that are often used in the preparation of food easier. Generally, blenders are better suited to working with liquids, whereas food processors essentially work well with more solid foods. 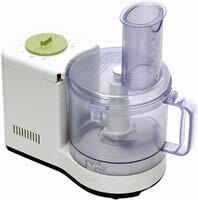 The food processor is considered to be more versatile than a blender as it can facilitate more functions than a blender. A blender is also called a liquidizer or a liquefier. A food processor is an electronic appliance which has a variety of functions in the kitchen. Food processor can also refer to a manual device, operated by hand, but in the modern context it usually does refer to the electronic ones. Food processors have a wide and short bowl, which is an appropriate shape for solid or semi-solid foods. They have a number of interchangeable blades, disks and attachments, which are suited to different functions. Also, while processing food in the food processor, no liquid is required unlike a blender, which requires some amount of liquid to move the particles around its blade. As stated previously, a blender is more suited to liquids. It can be used to mix, puree, or emulsify food and other substances. It has a long slender jar with a blade at the bottom, which is rotated by a motor run on electricity. The shape of the jar and the blade placement help create a vortex in the jar, which is significant in thoroughly blending the mixture. It usually comes standard with the jar and the fixed blade, however many modern blenders come with additional parts, attachment and blades. This is done in an attempt to give the blender more versatility and to increase its functions, so as so justify buying the product.